Our YardSaver Range of garden sheds offers exceptional value. Our colour YardSaver G66 steel garden shed offers exceptional value. It is a perfect medium size backyard garden shed priced to make sure it is a great bargain for everyone! This unit is big enough to fit your mower, gardening gear, camping, biking and painting gear without overpowering your backyard. Storage unit is supplied with step by step assembly guide illustrated with pictures to make the installation a fun and easy project. FREE anchor kits with this garden shed! Very easy to assemble with Spanbilt Fasttrak assembly system. NOTE: All Spanbilt Colour products come with Zinc Channels / Trims. I needed a shed. I’d just moved in to a brand new home and thought the garage would hold all my stuff. Wrong! But then I went and made the same mistake I’ve made so many times before… I went up to that green and red ‘superstore’ to see what they had on offer. It all seemed to be going well. I found a nice shed, and it was green, which would look great in my yard. But then I lugged it up to the counter on one of their useless trolleys only to find that the advertised price was only for the Zincalume model, not the one I wanted! What I wanted was $250 more! I argued with the manager and dumped the heavy boxes there at the counter, leaving the store fuming. It can’t be that hard to offer good customer service, I was thinking.I went home and got online. 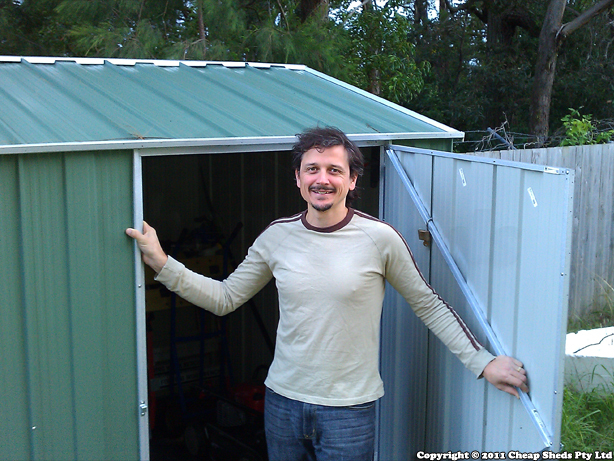 One search of ‘garden shed’ brought up https://www.cheapsheds.com.au. I liked the sound of that! Within 30 minutes I had looked through dozens of sheds, chosen what I wanted, got a bargain and had an email of confirmation that my shed was on its way. And the price? More or less exactly the same as the price I had expected to pay (but been denied) at that other place. Within a couple of weeks the boxes arrived and with a little help from siblings and friends my shed was up and I could park my car in the garage again. Krisztian and the team at Cheap Sheds have been great. Always keeping in touch with heaps of helpful advice and adding a real personalised touch to the service. I’m loving it. The best price I could find anywhere. Was wary that I might have bought down to a price and quality would suffer. I was wrong. Very well engineered and obviously manufactured on close tolerance jigs. The only holes that didn't line up where my fault (remember, if the big hole is on the bottom you have the sheets around the wrong way). I had to build this shed in a space measuring 1.3mtrs X 1.3 mtrs so didn't have the luxury of being able to do all the assembly from the outside. Still able to do it with the help of the detailed instructions. I moved into a new home and needed a shed, after looking around this one seemed to fit my space the best and after laying some pavers I put the shed down. I'll just say that it's really easy to flip panels upside down and think it doesn't matter which they go... but it does! The package comes in a rather nondescript box, but everything inside was there and nothing was in bad condition. The company handling the delivery needed a hand to move the shed out of the truck. This is something that could improve, the guy that delivered my shed really struggled helping me getting it into the house. There are more screws and washers than required, which is great. My shed needed to go into a corner, so I couldn't construct it where it needed to end up. Once the walls and roof is on, it's possible to lift the shed with two people by being inside and using the beam inside, that's how I did it anyway. (one person might be able to do this alone, but it's a bit tricky). The construction time takes all day, I built my shed over 3 days doing a few hours each day. I only had 1 drill, 2 drills would speed things up considerably as there's no need to change drillbits. For some parts a helper is required, but the helper will be pretty bored for most the time. Putting up the walls can be done with 2 people, just use two bins to pinch the third wall and hold it up. The door doesn't have much clearance from the bottom of the shed. If your shed area isn't elevated, you will find that the grass interferes with opening the shed door. Some reviews talk about things not lining up, most holes I found did line up. If it doesn't line up with a hole, you better recheck what you're doing. Where things didn't line up just drill a hole. It's a shed after all, not a swiss watch, all you want to really do it whack up some metal panels to stop the elements and make sure the thing is sturdy. I went and hosed the shed down and where I could identify water finding its way in, I just applied some silicone.